Autumn 1386. 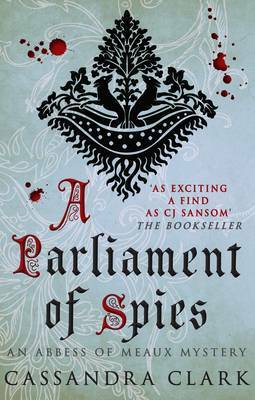 Hildegard of Meaux – a Cistercian Abbess with a keen instinct for crime solving is told that she and her companion, the monk Thomas, are to accompany the Archbishop of York, Alexander Neville, to London for the opening of Parliament amid much civic unrest. While packing to leave, the Archbishop’s saucier is found brutally murdered in an ale vat, and it emerges that the culprit must be one of the Archbishop’s party. The party sets off and during the journey to Lincoln, the first stop, they are ambushed but manage to repel the outlaws. When they safely reach Lincoln, the Archbishop instructs Hildegard and Thomas to interview all the forty-one servants and retainers in the party to establish their whereabouts for the period when the saucier, Martin, was suspected to have been murdered. After they finish this they give their report to Neville and he realises that he should ask some questions of his people back in York and using the technology of the time he has the enquiries relayed back to York by carrier pigeon and waits for the reply. Satisfied but anxious that the murderer must still be amongst the party he signals that the party, after several days delay in Lincoln should continue to London. The journey from Lincoln to London is fraught with more deadly surprises, and it becomes clear to Hildegard that this sinister plot may also involve King Richard, and those looking to depose him at all costs. Traitors, murderers, noblemen and madmen come together to create a puzzling scheme that only Hildegard can solve, digging up past grudges, new weapons and a mysterious friar. Hildegard has many more adventures before we reach the very dramatic conclusion. This is the fourth book that I have read by this very talented historical crime author, who before she became a full time writer worked as a history lecturer for the Open University and consequently has a passion for her subject which is vividly illustrated in her masterly story telling. The books are always expertly researched and full of excellent period detail which is very difficult to fault and really transports you back into the fourteenth century. The plot which is full of dramatic twists and turns, kept me entertained and transfixed until the very last page. I did not want this book to end, it was such a fascinating historical page turner. May this author write many more novels of this high quality in the future.